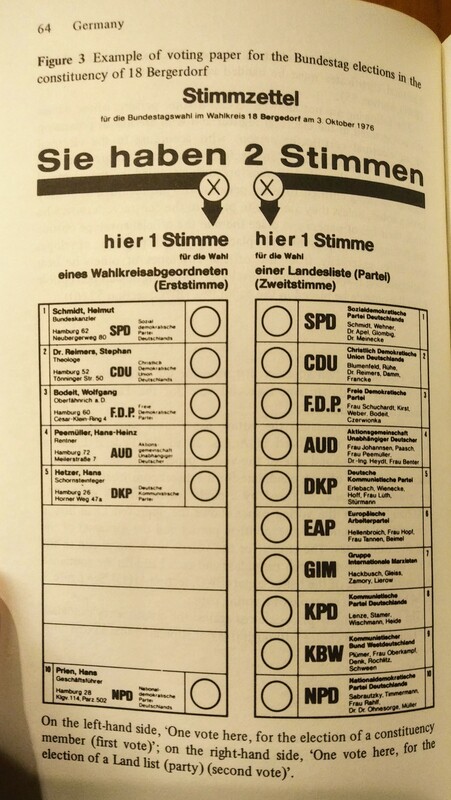 Christophe Sasse, “Germany,” Chapter 3 in European Electoral Systems Handbook, edited by Geoffrey Hand, Jacques Georgel, and Christoph Sasse, 58-86 (London: Buttersworth, 1979), 64. Judging from some recent reports in Quebec’s French-language press, I think that there is a good chance that Premier Legault’s government will in fact pursue electoral reform and that the National Assembly will switch Quebec’s provincial electoral system from single-member plurality to mixed-member proportional representation. L’autre enjeu, c’est le mode de scrutin proportionnel mixte. Les Québécois souhaitent que les partis collaborent davantage, et une telle réforme a le potentiel de changer la culture politique dans le bon sens, en atténuant la partisanerie. On s’est engagés à déposer un projet de loi visant à modifier le mode de scrutin dans la première année de notre mandat. Le délai est court, la ministre de la Justice a donc déjà commencé à travailler. On a l’intention de respecter cet engagement et de travailler de bonne foi avec les députés des autres partis. Ce qui nous guide, ce qui nous guide, dans cette réforme, c’est une représentation des élus plus fidèle au vote exprimé, mis en équilibre avec le poids des régions et la stabilité des futurs gouvernements. Fifth and finally, I think that the Legault government is serious because of what it did not promise to do: Legault did not say that the National Assembly will strike up a special committee to study the issue of electoral reform, he did not entertain the idea of establishing a citizens’ assembly on electoral reform (as British Columbia and Ontario did in the 2000s) and, even during the provincial election campaign last year, he expressly rejected the idea of holding a province-wide referendum on electoral reform. The federal Liberal Party has used the first method to great effect on multiple occasions spanning nearly a century, from the 1920s to 2016, while other provincial governments in British Columbia, Ontario, and Prince Edward Island have opted for the second two methods. All of these indirect methods undoubtedly decrease the probability that electoral reform will occur within a Westminster parliamentary system – whether you agree or disagree with the concept of switching electoral systems. In Quebec, referendums have become verboten and carry a destabilizing connotation because they evoke the spectre of secession – a political project with Legault has explicitly rejected in favour of autonomism and moderate nationalism. In any event, a provincial legislature can alter the province’s electoral system at will under the Section 45 Amending Procedure; referendums merely provide political expediency but do not constitute a legal-constitutional requirement. Ultimately, Legault’s approach to electoral reform – clearly specifying to which system the province should switch, campaigning on that policy, and introducing a bill to implement it – best conforms to the principles and practices of Responsible Government and would be greatly to Premier Legault’s credit. If a government truly believes in switching from a majoritarian to a proportional electoral system, then Cabinet should likewise take responsibility for implementing it fully instead of using citizens’ assemblies and referendums as intermediaries. In the current National Assembly, three of the four parties (the governing CAQ and the two lesser opposition parties, the confused and near-defunct Parti quebecois and socialist-secessionist Quebec solidaire) support electoral reform, while only the Liberals, the Official Opposition, support SMP. If the Legault government follows through and tables that bill, it should easily pass with a super-majority of MNAs. Adopting MMP would also make Quebec unique and could appeal to this autonomist impulse that Legault has thus far successfully channelled: no other province has ever implemented MMP; Quebec could possess not only a distinct society but also a distinct electoral system, too. In writing this post, I hope to do my part in collapsing the Two Solitudes which still very much characterize Canada today, and perhaps even more so than they did when Hugh MacLennan first coined the phrase in 1945. The English-language media outside of Quebec (and even, much to my surprise, within Quebec, given that the Montreal Gazette only mentioned provincial electoral reform in Quebec once in an article from October 2018) has assiduously ignored this subject altogether, even though it would almost certainly have implications for the rest of the country. Or perhaps I should say, if Quebec switches from SMP to MMP, this policy would reverberate throughout the country and reinvigorate similar efforts in the other provinces and in Ottawa – if English-speaking proponents of electoral reform take notice of it in the first place. Electoral reform will remain a salient political issue and will become a more potent force at the federal level if a province successfully switches from SMP to a proportional system. Mathieu Carbasse, « Les 100 engagements de la CAQ au pouvoir » L’Actualité, 2 October 2018. Guillaume Bourgault-Côté, “Réforme du mode de scrutin: ‘On ne fera pas comme Justin Trudeau,’ jure Legault,” Le Devoir, 10 September 2018. François Legault, « Discours d’ouverture » Journal des débats de l’assemblée, 42e Législature, 1er Session, Vol. 45, no. 002 (le 28 novembre 2018), 20-21. Charles Lecavalier, “Premiers pas du gouvernement Legault vers une réforme du mode de scrutin,” 16 January 2019. Roman Schué, « Legault veut une réforme du mode de scrutin mais sans référendum, » Radio-Canada : Nouvelles, 24 September 2018. The Canadian Press, “Francois Legault Urgued to Follow Through on Electoral Reform Promise,” 8 October 2018.